SEQUENTIAL SKETCHES, a must for all who love to watch paintings unfold. 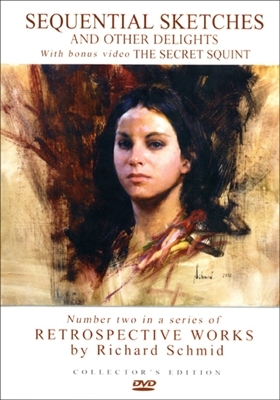 Richard offers 70 of his works painted from life, many shown in sequences from beginning to end while Richard describes in detail how he created each painting. Special features include the award-winning bonus film: THE SECRET SQUINT starring Richard Schmid as a young artist who discovers magical painting powers with a secret squint.